A statement of confidentiality is a part of every confidentiality agreement, including a vendor confidentiality agreement. This agreement occurs between one or more parties. 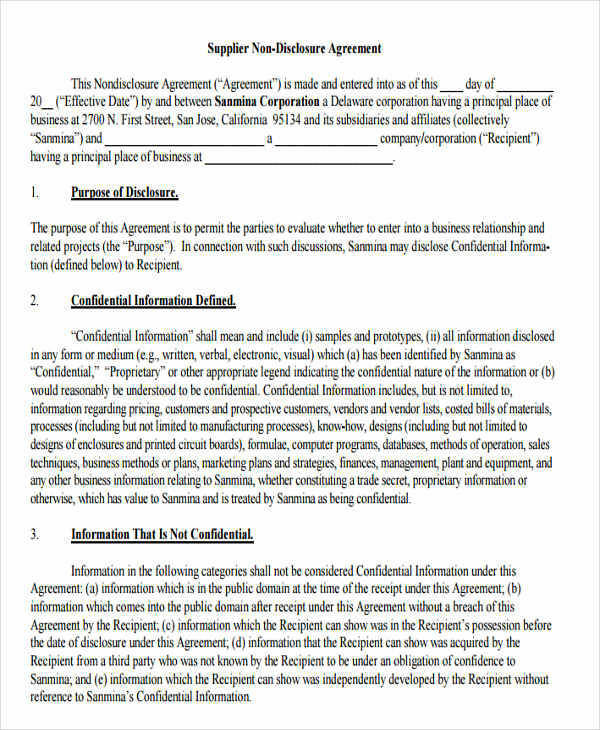 A confidentiality agreement is a legal agreement that is enforceable by the law. 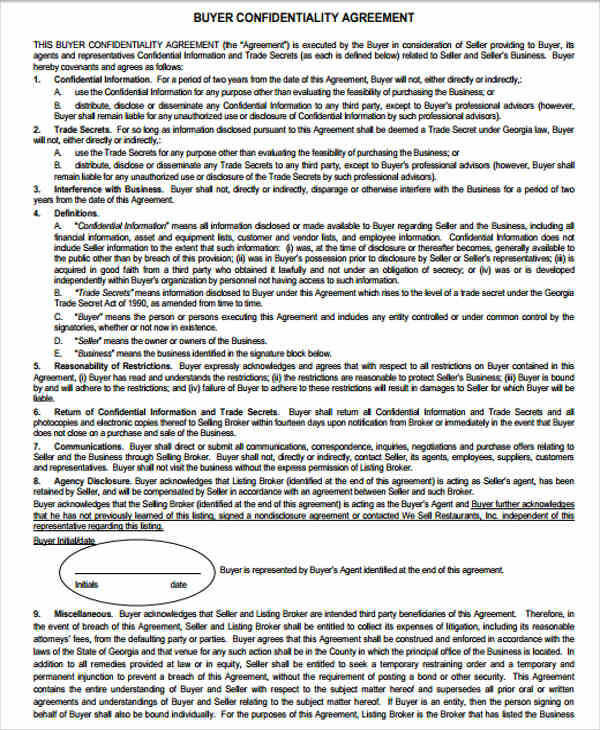 It obligates all the parties involved to the contract agreement that they signed. A letter of agreement works is another type of agreement. Its purpose is based on the type of transaction that it is going to be used for. 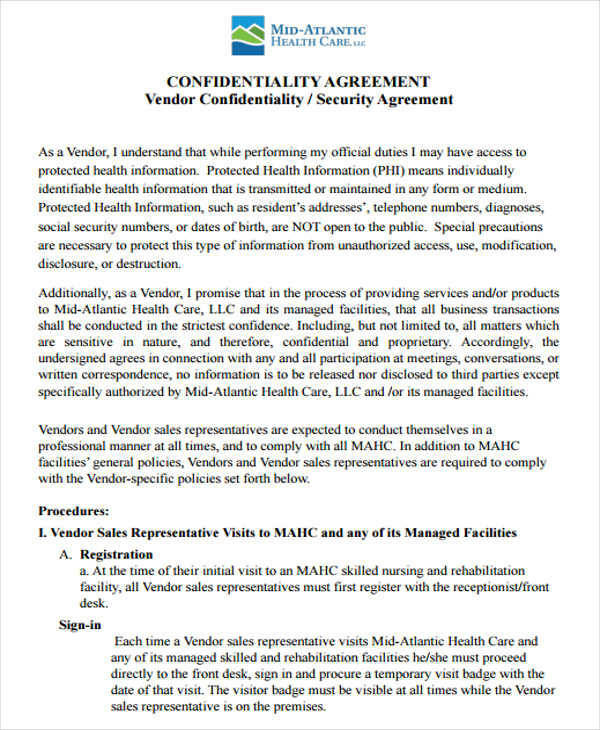 You will be able to make vendor confidentiality agreements with the help of this article and the sample agreements that are available for download in this article and our website. 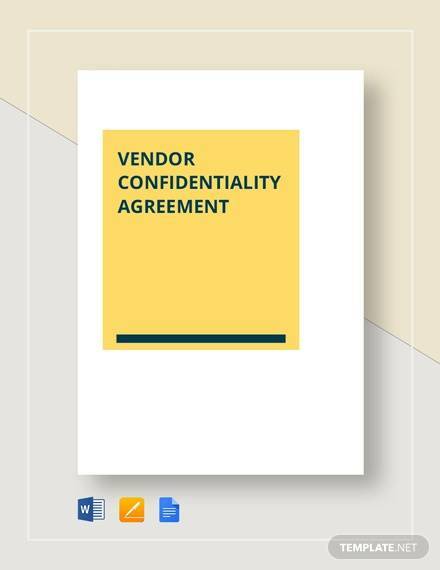 What Is Vendor Confidentiality Agreement? 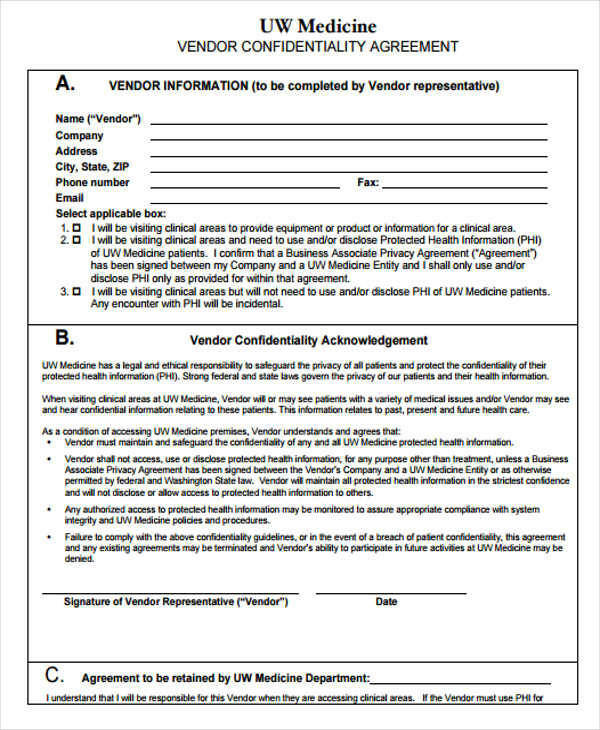 What is a vendor? A vendor is also know as a supply. They supply or provide goods and services to companies and individuals for the purpose of earning profit. 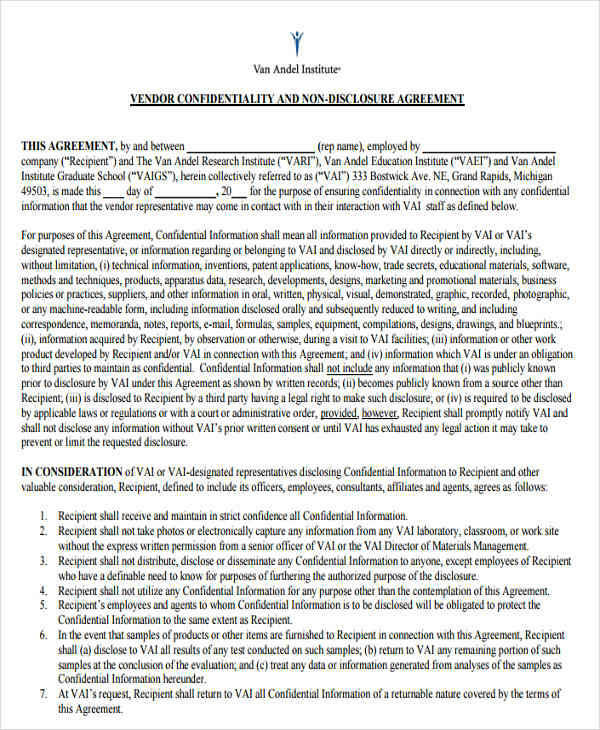 A vendor agreement is one that is agreed upon by both a vendor and buyer for the sale of goods, services, and even properties under specific terms and conditions. 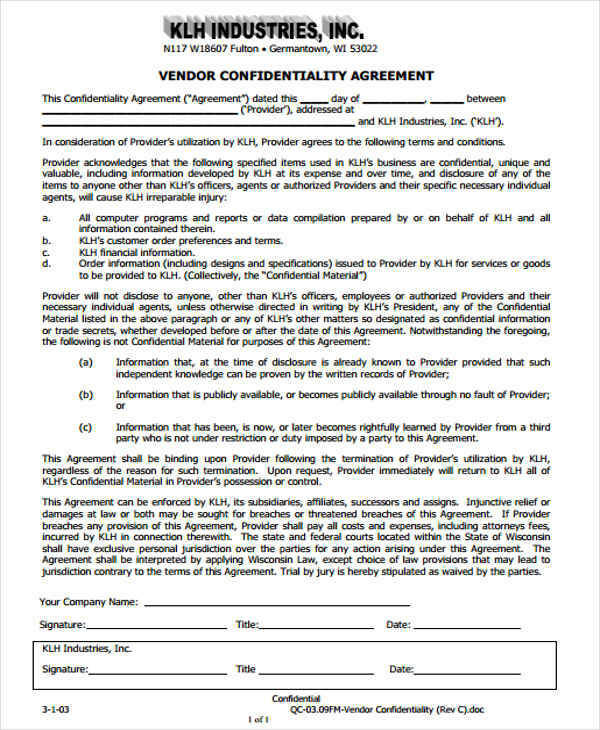 But when you say a vendor confidentiality agreement, it means that it is an agreement where both vendor and buyer, and other parties included in the agreement, agree to not disclose any information that is related to their business transaction. It is a legal agreement, thus all the parties involved are bound by it. You may check out related topics, like agent contract agreements and basic agreements. 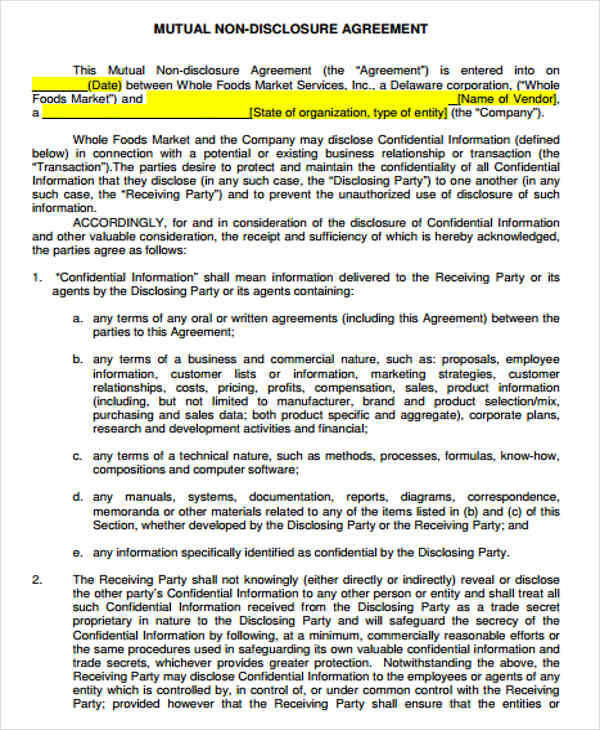 Why is a confidentiality agreement important, like a vendor confidentiality agreement? There are a number of reasons why this is so and some of them are provided below. When doing business with a specific buyer, the offered price is kept confidential between the two parties, just like in a sales contract agreement. It builds trust, and fosters a good and long-lasting business relationship. It keeps trade secrets safe by limiting the involved parties from disclosing specific information. To provide you with all the help you need, we have listed here the tips that we have used in creating our sample agreements. These tips can also be used when writing wedding contract agreements or construction contract agreements. Set your page margin to the same size for all sides to make look like it is framed. It also makes your document look professional. Determine the font style you will be using and limit it to the traditional font styles. Do not use a font size below size 10 as it may be too small and unreadable. Put the names of the all those who are involved in the contract so that they will be bound by it and will be obliged to follow what has been agreed upon. Use simple words and avoid using technical terms. If you must use them, include a definition page in your contract. Write clearly and concisely. Your contract should not lead to conclusion or provide ambiguous statements. Do not forget to spell-check and proofread your contract before making copies of it.